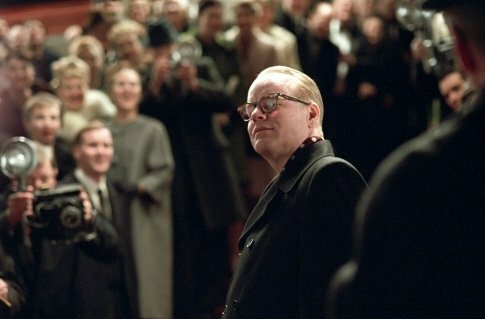 A slow, well crafted film that verges on the cusp of dullness but never quite gets there thanks to a mostly interesting story, some great cinematography, and a great performance from Philip Seymour Hoffman. It is a bit of a chore to get through at times, namely whenever Hoffman isn’t prominently displayed in some way, which, thankfully, isn’t very often. The film is a very well made study in the psychology of a vain, petty, but nonetheless talented and well-respected man who ultimately cares more about creating and maintaining a legacy than actually showing anyone any kind of humanity, even close friends and lovers. And yet, Hoffman manages to elicit a great deal of sympathy from us for the character, especially toward the end when things start coming together and falling apart for him almost simultaneously. It’s a very internal film, requiring Hoffman to carefully tread the line between overt flamboyance and reserved suffering, which, to his credit, he pulls off extremely well. Overall, I liked the film. It’s slow at times and not for everyone; no epic action scenes or explosions here, or even that much of a slow build really. It’s a painful film about a man who gives up his soul for fame, among other things. So, yeah, good film.